TSK is currently working with Runsun Development Group on the CXTX Auto City. Phase 2 is a mixed-use development based on an auto theme. 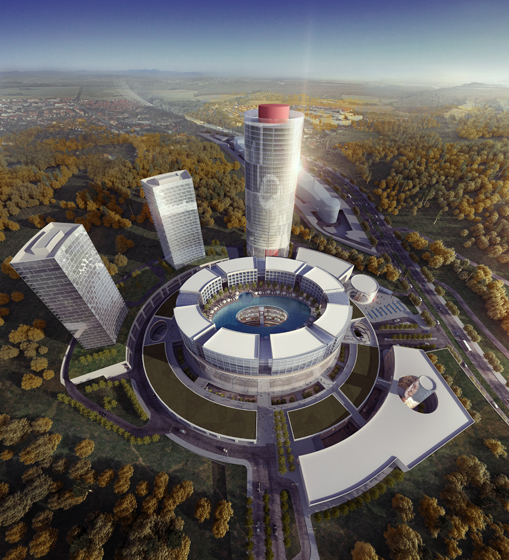 The three million square-foot project consists of dealerships, used-car center, new car exhibition showroom, retail, cafeterias, 492 foot tall office tower, hotels, resorts and two apartment towers. The design is based on the characteristics of a hillside village. Winding roads with shops on both sides remind people of charming Italian mountain villages. Winding roads are not only pleasant to walk but also interesting to drive. The road is designed to fit the human scale. The bridge that connects both sides on the upper floor activates the space, thus becoming a focal point and a viewing platform. Phase 3 consists of approximately 10 million square feet. It will feature a number of attractions and theme park activities related automobiles and car racing.